First step was to analyse original SIMADYN D software to find the best solution to keep the compatibilty with existing functions and systems and add new functions. 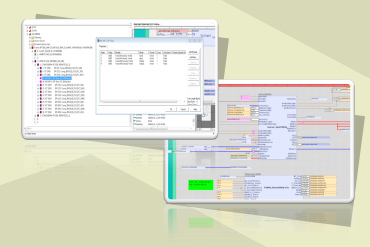 Second step was to redesign original functions and prepare the software for Logicad platform. This system contains the sequential control of automatic transport rolled out coils, including their banding, marking and weighing, up to the rolled out coils store. The system controling all valves for the delivery of the right amount of cooling water for requested target temperature of each specific material during coiling. The system is tracking all coils from the begining to the end of rolling process. This system is memorizing and monitoring positions and technological informations (coil number, weight, diameter, material code....) of each individual coil in the rolling mill. this part contains the control of all synchronous and asynchronous drives and their communications to invertors. The second phase of integration test was done in testing area of SMS Site Services Inc. company in Pittsburgh PA USA with ultimate customer's representatives presence. The main target of this part of the integration test was to introduce new functions to the ultimate customer. The commissioning was done at ultimate custommer in the USA. The main supplier of whole technology and master of whole commisioning was the SMS Site Service Inc. The commissioning included hw signal check, movements check and optimalization of control loops, manual and automatic function check, production start and support.